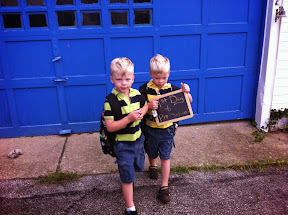 The boys started preschool on Tuesday. I took a day off work so I see them off on their first day. I totally wanted to spy out the window to see how their day went. They had no issue with us leaving. "Ok bye" Jake said as we told him we'll pick him up after school. Joy and I went home sad... Sat on the couch and watched Sherlock. Then stopped at post office... Then picked them up. I hoping to see them a little in action but parking was crazy and got there as soon as they let out. I got a big hug from Jasper and then Jake when they got out. It was hard to get any info from them on their day. Did you have circle time? Jake was a bit upset we didn't stay and play with them at school. He didn't want to leave. Jake later gave us little bits if info which always ended with "... And that's it!" We let them chill and play games when they got home. Then went for a walk and saw a waterfall. On the way back we let them play at McDonald's playplace.